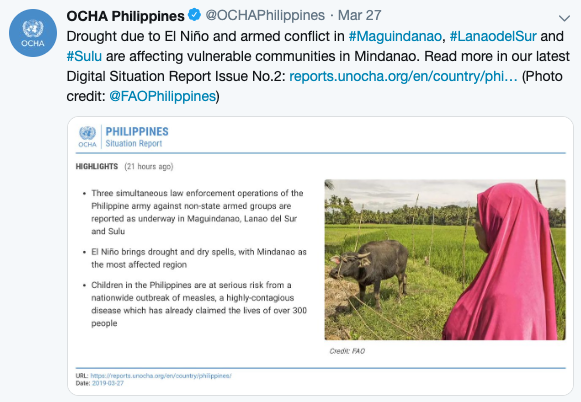 OCHA products are designed to help everyone involved in a humanitarian aid operation find the information they need to understand the context, organize an effective response and monitor results. Over time, we developed several core reporting products: Flash Updates, Situation Reports and Humanitarian Bulletins. We also continue to produce maps, snapshots, infographics and other kinds of media. At the same time, we want to make sure our products meet our users’ needs and, wherever possible, leverage new technology that will improve their experience. OCHA recently completed a long-term Field Reporting Review that surveyed some 1,500 humanitarian workers. We learned a lot from this exercise, and several very clear recommendations stood out. Readers want updates closer to “real time” and would welcome more frequent, more targeted information. They want more visuals and more analysis. And they don’t want to hunt through multiple platforms or products to find what they need. Our reporting staff want a more dynamic way of sharing information - something that is flexible, well-designed and modern. Based on this feedback, we’re introducing the OCHA Digital Situation Report -- an online platform where OCHA offices can post new content as it becomes available and verified, bringing readers closer to “real-time” updates. The project started last year and was added to ReliefWeb Labs in November. The overall idea is to simplify OCHA's portfolio of products and move them out of static PDFs into an online format. This format will be more dynamic, visual and analytical, and will save users time by automating distribution and design. Because we know many of our readers still want a PDF, this is available at the click of a button. PDFs will also be archived on ReliefWeb so readers can find past information that may no longer appear online. Furthermore, each content block is easily shareable and can be surfaced on other interfaces. In late December, the first three pilot countries came online: Burundi, the Philippines and the Ukraine. The teams quickly discovered the benefit of being able to update their Situation Reports whenever they wanted (as opposed to a set schedule), easily share a direct URL to their report (and have it look great on any device), quickly share the entirety or pieces of the report on social media, and even print a beautiful PDF. 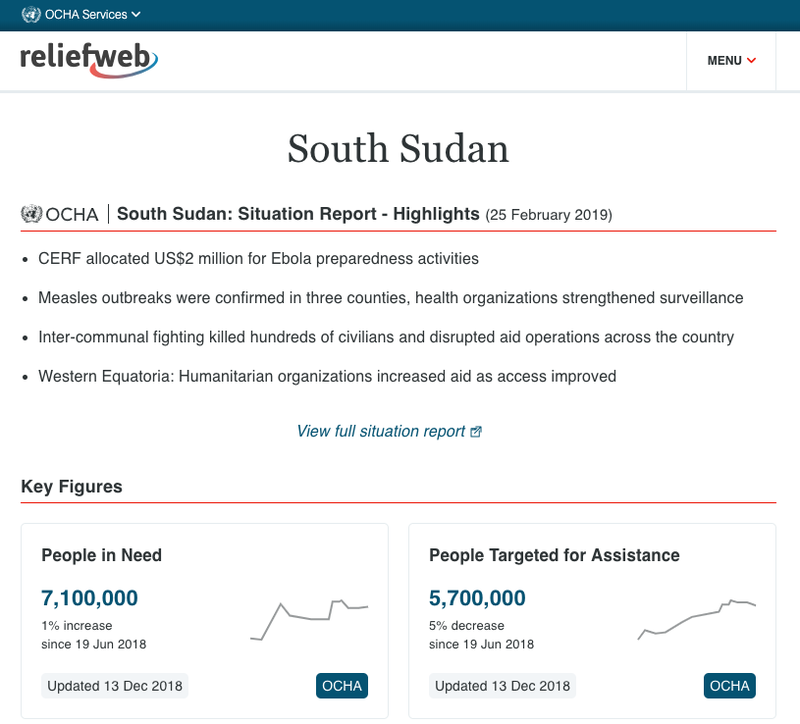 South Sudan, the latest office to join, was the first to include a YouTube video - a clear step towards a modernized OCHA Situation Report. Throughout the process, the design approach has been iterative - building on feedback from users and readers as the platform develops. OCHA is not a software company, so we outsourced the content infrastructure to Contentful, an industry-leading provider of content infrastructure, while we focused on the kinds of issues we know our readers prioritize - good design, PDF exports, accessibility, multilingualism and low bandwidth access. It has been a great exercise in helping to determine where they can get the most impact for their technological investments while minimizing long-term maintenance costs. The code is open source on GitHub. As always, we welcome feedback, comments and suggestions. This is the most recent article.